Did you ever hear of the tale of the vengeful bride? It's tragic. It's horrible. And it's totally true. A young blushing bride was looking forward to her reception right after the ceremony. It was a beautiful day. The sun was shining. The birds were singing. Everything was going well until she walked into the party. The dessert table was in the wrong place. The bar wasn't serving the couple's signature cocktails. She held herself together until the DJ started playing their first song. It wasn't, At Last like they had requested. As the young bride and groom waited on the dance floor the DJ blasted Another One Bites the Dust. That was it. The blushing bride turned red and swirled into a blur of anger. She blasted right out of one of the stained glass windows. They say you can still see her on moonlit nights, looking to drag young wedding DJs into eternal torment with her. 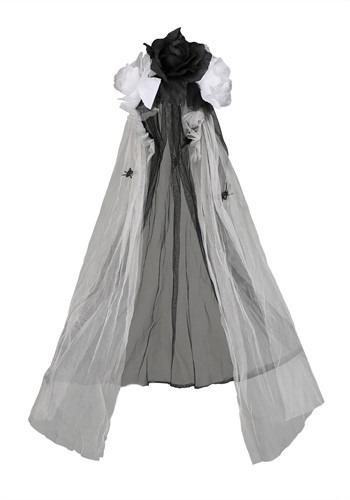 Whether you're looking to become a ghostly bride or you want the perfect accessory for your October bachelorette party, this veil blends bridal beauty with dark and broody in just the right way. The plastic headband is crowned with gray and black flowers while a black veil falls down the head and shoulders. You'll even have a couple of spiders intertwined in the design. Now that's what we call shabby chic!